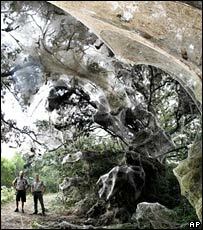 An enormous spider web has been found at Lake Tawakoni State Park, Texas, US. It is not the work of one giant spider - rather, millions of small ones have been spinning away and now it is twice the size of a football field. Park rangers are not sure why the spiders have joined forces - they describe it as a rare occurrence. Texas A&M University entomologist Professor John Jackman told Associated Press that there were reports of similar webs every couple of years. The web covers a 180m (590ft) stretch of trees and shrubs in the park. Although it was initially described as "fairy-tale" white, it has turned brown from all the mosquitoes caught in its trap. Experts say the web is either the work of social cobweb spiders that work together, or it has been created by spiders spreading out from a central point. The park superintendent, Donna Garde, has invited arachnid and insect specialists to the park to study it first-hand. Rangers said they expected the web to last until the autumn, when the spiders will start dying off.